Here are my cards using Penny Black's clear stamp sets called "Every Which Way". I've recently acquired all 4 Critter stamp sets, and oh, I just cant wait to create more with these images. They are incredibly adorable!! oh what a sweet card! Adorable cards! Love that porcupine one! All 3 are just precious! Love the cat, the dog and those cute little hedgehogs! All art, creativity, papercraft creations, content, designs, concepts, text, photographs & ideas are my own work & official COPYRIGHT of ©Cards By America. My creations are showcased here to help inspire & promote. My work may NOT be reproduced for the use of publications, design contests or any profits without my prior consent. Please respect this Copyright. 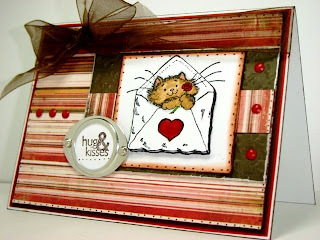 I so enjoy creating using the latest brands, products, trends & techniques in the paper crafting industry. My projects are made with special care. I use high quality products from various companies. Lots of original craftsmanship goes into my 1-of-a-kind detailed makes! I hope to have inspired your creativity. Please always reference & give credit to those that have sparked ideas & creativity! Come join us for inspiration & don't miss out! Copyright, Cards By America. Simple theme. Theme images by macroworld. Powered by Blogger.